I’m a little surprised I requested this book from Netgalley. That cover looks an awful lot like the style used on so many not-to-my-taste cozy mysteries – I really don’t like that style. It might have been the “Academic Mystery” that got me – and I’m glad it did, because I really enjoyed this. The main character, Professor Lila Maclean shares several of the characteristics cozy mystery authors often give to their characters – she’s klutzy, smart, and beleaguered by her boss for no reason that is sensible to a sensible person. She has a colorful (to put it mildly) mother, with a past that serves as a great basis for this and future stories. What differentiates this book from others I’ve seen is that it’s believable. It’s – what’s that really annoying adjective? Organic. Lila isn’t klutzy to further the plot, or to make her an Extra Quirky Cozy Heroine – she just is. In fact, it makes sense that there’s a psychological basis for it. Her boss’s antagonism is somewhat out of the blue, but there is a seed of “because” in there. He hasn’t taken against her randomly – and that antagonism feels really familiar. We’ve probably all known, and God help us worked for, people just like him. and beleaguered by her boss for no reason that is sensible to a sensible person. The story is twisty and – yay! – unpredictable. At one point I was just waiting for one character to get knocked off – I was sure of who the next victim was going to be – and I was completely wrong. And the author did that on purpose. It was a great fakeout. It was just a lot of fun. And I will absolutely read more by this author. This is Netgalley doing what Netgalley’s supposed to do. “Pat the gryphon, Lil,” she commanded sternly. 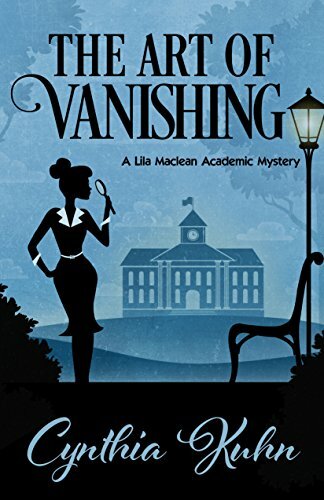 This entry was posted in books, mystery and tagged Cozy mystery, Cynthia Kuhn, Lila Maclean, Lila Maclean Academic Mystery, NetGalley, The Art of Vanishing. Bookmark the permalink.